Did you know there are many home heating options available in 2018? With all of the home heating options available in 2018, which one is best for you? Is it a heat pump, geothermal energy, hybrid heating, solar heating, or a natural gas furnace? And after you decide which one, then which brand of equipment are you going to use? There’s a lot to think about and to research. That’s why talking to an expert like AirXperts Heating and Cooling on the topic will cut out all of that guest work. This article will go over a hand full of the most popular heating options available in 2018. Let’s discuss heat pumps for a moment. 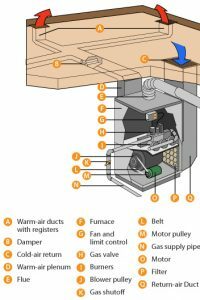 What is a heat pump? A heat pump looks like an air conditioner. In fact, it even acts just like an air conditioner in the summertime by compressing the refrigerant to chill it, and sending the chilled refrigerant inside to the indoor coil. Once the indoor coil is filled with cold refrigerant, the fan motor in the furnace or air handler forces warm air from the home through the chilled pipes to both cool and dehumidify the air. The difference in a heat pump and air conditioner is the fact that a heat pump can also heat your home in the Winter. 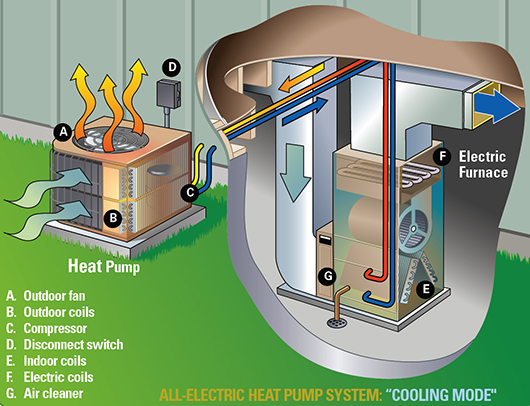 A heat pump is all electric just like an air conditioner. It is able to heat by reversing the cooling process. Instead of chilling refrigerant, it extracts heat energy from the air outside, and uses this heat energy to heat up the refrigerant, and then send that inside to the indoor coil. Even when the air is cold, heat energy still remains. The efficiency of a heat pump is measured with a Seasonal Energy Efficiency Rating (SEER) for cooling and a Heating Seasonal Performance Factor (HSPF) for heating. The higher the ratings, the more efficient the equipment. Indoor components such as the coil and fan motor also play a role in overall efficiency. For a heat pump only installation, an air handler (also called a fan coil) is used inside. A fan coil in a basic sense is the combination of the coil from an evaporator coil and the fan motor from a furnace. Overall, a heat pump offers you an energy-efficient alternative to furnaces and air conditioners. Heat flows naturally from a higher to a lower temperature. They use a relatively small amount of energy (electricity, fuel, or high-temperature waste heat). Thus, heat pumps can transfer heat from natural heat sources, such as water, to a home, building or an industrial application. Because heat pumps consume less primary energy than conventional heating systems, they are considered a plus for reducing greenhouse gas emissions! AirXperts is committed to providing the finest West Virginia heating and air conditioning solutions by using industry best equipment and providing technical excellence in installation, repair and maintenance services. Although we are experienced and capable of working on any brand of equipment, we have found that Goodman, Rheem, York & American Standard air conditioning products have some of the highest efficiency ratings and performance capabilities in the business! As a leader in West Virginia heating and air conditioner solutions, we encourage you to give us a call today at (304) 562-7300! As a leading West Virginia air conditioning company, we also offer hybrid heating solutions. The hybrid heating means that instead of a furnace and air conditioner, or air handler and heat pump, we install a furnace and a heat pump. But why two heating sources? Because at certain temperatures an electric heat pump is more efficient than a gas furnace. When our West Virginia winter days are very cold, a gas furnace is cheaper to run than an electric heat pump. With a hybrid heating installation, your thermostat will intelligently switch between heating sources depending on the temperature. This, in turn, can save you money, and we all like to save money, yes? For a typical West Virginia home split system, there is an air conditioner located outside, and a gas furnace and evaporator coil located inside the home in a closet, garage or attic. Once the heat exchanger has had time to heat up, the fan motor inside the furnace pulls cool air from the home and forces the air through the hot heat exchanger. This in turns heats up the air and it is then redistributed into the home via ductwork. Some furnaces can also be converted to use propane instead of natural gas for more remote West Virginia area locations. The efficiency of a gas furnace is measured with an Annual Fuel Utilization Efficiency (AFUE) rating. An AFUE rating indicates the percentage of fuel that is turned into actual heat energy vs. being wasted. AirXperts offers various brands of furnaces with AFUE ratings up to 95% which means 95 percent of gas used is being converted to heat energy! If you are looking to save money in the long run, geothermal heat pumps are one of the most effective ways to do so. They not only heat and cool a home, but they also provide hot water. 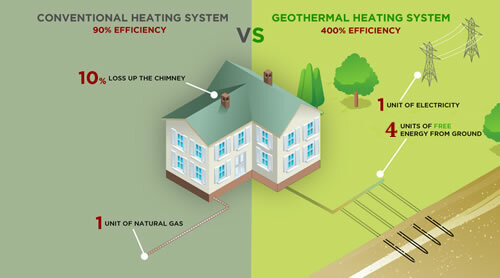 More and more homeowners are discovering the benefits of geothermal heating and cooling. This simple system uses the temperature of the Earth a few feet underground to heat and cool. 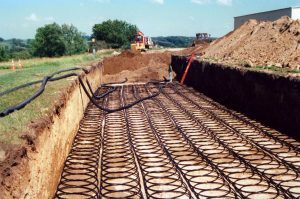 New homes owners, new construction, and even well-lived in homes can usually be retrofit to have a geothermal energy efficient system installed. According to the Environmental Protection Agency, geothermal systems are the most energy efficient, environmentally clean, and cost-effective space conditioning systems available. A two-speed geothermal heat pump system is so quiet inside a house that users do not know it is operating because there are no tell-tale blasts of cold or hot air, depending on whether it’s the heating and cooling season. Geothermal heat pumps also improve humidity control by maintaining about 50% relative indoor humidity, making geothermal heat pumps very effective in humid areas. Geothermal heat pumps save money in operating and maintenance costs. There is definitely an initial purchase price that can throw some off from purchasing. But did you know a residential geothermal heat pump is often higher than that of a comparable gas-fired furnace and central air-conditioning system? It’s also more efficient, thereby saving money every month! For further savings, in the summer cooling period, the heat that is taken from the house is used to heat the water for free. In the winter, water heating costs are reduced typically to about half that of your normal bill. Let’s look at maintenance for a geothermal system. There are fewer mechanical components, and because those components are sheltered from the elements, leaves, dirt, and possible vandalism (like copper thieves), geothermal heat pumps are durable and highly reliable. The underground piping used in the system often has a 25 to 50-year warranty, and the geothermal heat pumps themselves typically last 20 or more years. When properly installed, the underground components are virtually worry-free. The components in the living space are easily accessible, which increases the convenience factor and helps ensure that the upkeep is done on a timely basis. AirXperts technicians have the experience required to work on any brand of heating equipment. We will also recommend the most affordable and reliable brands for your particular living situation. For new installations, we base our West Virginia HVAC services on the foundation of Goodman, Rheem, York & American Standard equipment for reliable, efficient heating and air conditioning performance. Contact us or Call us today at (304) 562-7300 for more details, or and advice on heating options for you.